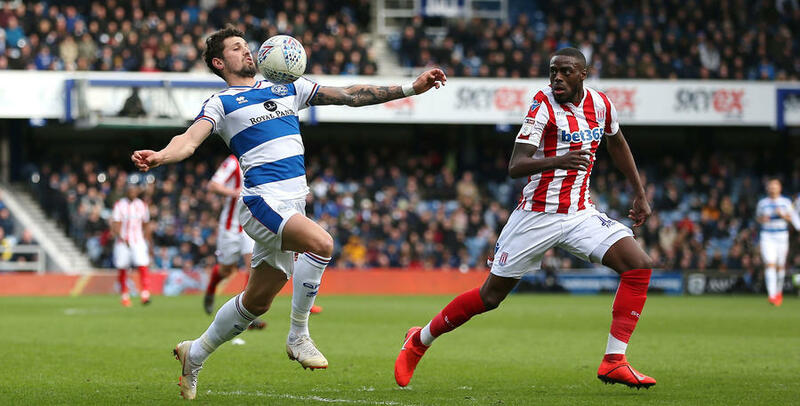 RANGERS were forced to share the points in an untidy Sky Bet Championship affair at Loftus Road. Visitors Stoke City had to play with 10 men for over 80 minutes, following Sam Clucas’ early dismissal for a stamp on Josh Scowen. But QPR lacked the cutting edge to break Nathan Jones’ Potters down, and themselves finished the game a player light after Grant Hall was shown a second yellow card for his tackle on Tom Ince. Following last weekend’s derby defeat at Brentford, R’s boss Steve McClaren made two changes to his starting XI for the visit of Stoke. Tomer Hemed and Scowen were both handed starts, with Ebere Eze and Darnell Furlong dropping down to the bench. Matt Smith missed out altogether through injury – an ankle problem picked up in training this week. Rangers – in a 4-4-2 formation – lined up as: Joe Lumley; Jordan Cousins, Toni Leistner (captain), Hall, Jake Bidwell; Pawel Wszolek, Massimo Luongo, Scowen, Luke Freeman; Nahki Wells, Hemed. The blustery west London conditions weren’t exactly conducive for a free-flowing contest early on. There was drama in only the eighth minute, however, with visitors Stoke reduced to 10 men. After Scowen executed a sliding challenge on Clucas, the latter was subsequently shown a straight red card for a stamp on the R’s midfielder. Referee Gavin Ward wasted little time in making that decision. Advantage Rangers, then, who went mightily close to taking the lead come the 17th minute – Luongo’s edge-of-the-box half-volley darting only inches wide. Three minutes later, Freeman’s turn and shot from just inside the penalty area was collected by Jack Butland. A man down, it became obvious that Stoke were happy to let Rangers dominate possession. However, the R’s were unable to ask any real questions of the visiting defence up until half-time, in a first half that continued to be a bit of a scrap. Freeman’s distance effort in the 26th minute, that was easily collected by Potters goalkeeper Butland, was as close as QPR came ahead of the break. If anything, it was Stoke who came closest to scoring – Charlie Adam’s range attempt shooting only marginally past the upright six minutes before the half-time interval. Looking to pose a greater attacking threat, Rangers made their first change of the afternoon ahead of the second half. Wszolek made way for Bright Osayi-Samuel. Visiting ‘keeper Butland was forced into his first real save of the match in the 53rd minute, fashioning a fine stop to palm away Wells’ stinging effort from a narrow angle. Stoke then continued to contain and frustrate thereafter. Rangers were struggling to get near the Potters’ goal at the Loft End, and were limited to long-range efforts that did little to trouble Butland – Osayi-Samuel producing a curling shot which met that description in the 63rd minute. A second R’s sub arrived in the 73rd minute, as Olamide Shodipo replaced Scowen for his first senior appearance in over two years. However, the home side’s next effort of note didn’t arrive until the 83rd minute. Hemed couldn’t get enough power on his header, from Bidwell’s left-flank centre, as Butland collected with ease. Four minutes later, Rangers were also reduced to 10 men. Hall – already on a booking – hauled down Ince on the edge of his own box, and was soon shown a second yellow card and subsequent red. As a result, the R’s introduced Furlong at the expense of Wells to add to their numbers in defence. 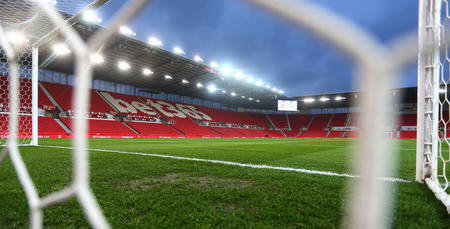 Five minutes were added on at the death, and Stoke almost stole a winner just moments before the length of stoppage time was signalled. Sub Mame Diouf’s header dropped just past the left-hand post. At the other end, meanwhile, Hemed sent his own headed attempt past the upright in the 93rd minute. Ultimately, though, there was to be no goalscoring action, with both teams having to settle for a point apiece. What TV channel is Stoke City v QPR on?